Israel is steadily pulling away from the OECD and toward the U.S. as the private portion of its healthcare spending rises steadily. Will this also lead to a similar direction in healthcare outcomes? Both in terms of healthcare outcomes and costs, the United States has underperformed over the last four decades when compared with the average developed country of the Organization of Economic Cooperation and Development (OECD) as well as relative to Israel, a recently admitted OECD member. Healthcare costs have been growing faster in the United States than in the other developed OECD countries, including Israel, while the health outcomes have been improving faster in the OECD and Israel. These are some of the findings in a recent Taub Center study by Prof. Dov Chernichovsky, Dr. Ronni Gamzu and Dr. Guy Navon that appears in the Center’s annual State of the Nation Report. Prof. Chernichovsky is the Chair of the Center’s Health Policy Program and a senior staff member at Ben-Gurion University of the Negev. Dr. Gamzu is the recently appointed Director-General of Israel’s Ministry of Health and was formerly a Policy Fellow in the Taub Center’s Health Policy Program and Director-General of Ichilov Hospital (the study was conducted prior to his appointment). Dr. Navon is a Policy Fellow in the Center’s Health Policy Program and a researcher at the Bank of Israel. Focusing on costs, the first figure shows that healthcare expenditures have risen in the United States from 7 percent to 14 percent of the Gross Domestic Product (GDP). This compares with a relatively modest increase from 5 percent to 8 percent of GDP in the 22 developed nations of the OECD and in Israel. 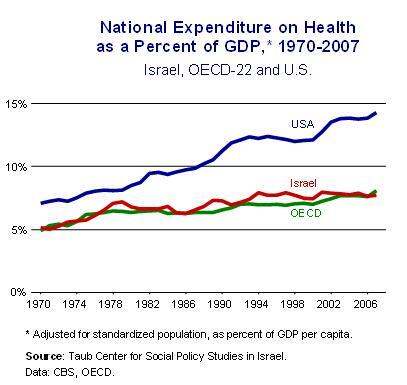 Thus, from a cost perspective, Israel’s record has closely matched the rest of the developed OECD countries – excluding the U.S. – that provide universal health coverage. While cost increases have not been as high as in the U.S., life expectancy has improved in Israel even more than the OECD average. In retrospect, Israel appears to have received relatively good value for its expenditures on healthcare since the 1970s. However, an “Americanization” process in Israel’s healthcare system has been raising concerns of a problematic future. 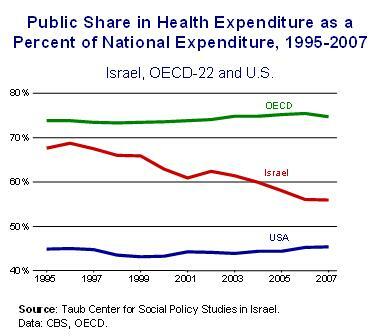 As is evident in the second figure, the public share of total health care expenditure in Israel has been falling steadily, deviating from the OECD average and converging toward the relatively low American share. There is ample evidence that private financing of health care is much less effective than public financing in controlling costs, and indeed in this same period Israel has begun to experience a relative rise in healthcare prices. The inflation in healthcare prices reflects declining efficiency in Israel’s healthcare system. It means that the increase in healthcare costs passed on to the public has been greater than the increase in services it received. Inflation also leads to declining equity. The fact that healthcare prices have risen more than other prices and incomes aggravates an already difficult situation caused by the growing share of private healthcare financing. The merging of these two factors reduces access to care while increasing the burden of healthcare spending on the budgets of middle, and particularly, low income households. Furthermore, these developments may eventually undo many of the country’s achievements in health outcomes. In some respects, this situation is reminiscent of the diverging healthcare paths in the United States and those of other developed countries – including Israel. Despite the superiority of the American system from the perspective of technology and the level of resources invested in healthcare, its outcomes are relatively modest. The “Americanization” of healthcare financing in Israel which is currently only expressed in inflation, and not yet in terms of health outcomes, brings Israel closer to the less desirable elements in the American system: high cost coupled with ever increasing disparities in accessibility to care.